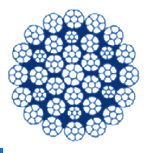 Welcome to the Rope Services Direct product page for our 34×7 non rotating wire rope, one of many of our popular and highly beneficial rotation resistant range of equipment. While each product within this range performs a similar function with similar function, the construction of each will lend to more or less strength, flexibility and resistance. If you would prefer to jump ahead and quickly enquire about what the right type of product might be for your operation, please find our contact details at the bottom of this page. Constructed from strong and corrosion resistant stainless steel, this innovative 34×7 equipment is a product that is built to last. It’s unique construction of outer and inner layers that run in different directions mean that it is highly resistant to rotating. This is perfect for lifting operations where you need to keep movement to a minimum and completely in your control. This type of equipment can have two or three layers, with this particular product having three. This means that it is even more resistant to rotating than its counterparts that have two layers. To discuss anything that you’ve read above, or for all other enquiries, please don’t hesitate to give us a call on 01384 78004. Or, if you know what you’re after and you’re ready to order, you may find the contact us page or the rapid enquiry form at the top of this page more useful. 34x7 Non Rotating Wire Rope Overall rating: 5 out of 5 based on 6 reviews.